Having photographed weddings off and on for over 25 years, we thought we’d seen most types of weddings. Now and then somebody throws us a crazy, unorthodox, alternative curveball, and that’s a ton of fun. But not Nick and Elena. They threw us a beautiful, orthodox, traditional curveball: a full-on Greek wedding, right here in Portland, Oregon! From the traditional Greek Orthodox ceremony, to the big family, liquor, laughter, lamb, baklava, dancing, and yes, plate breaking, they had it all. 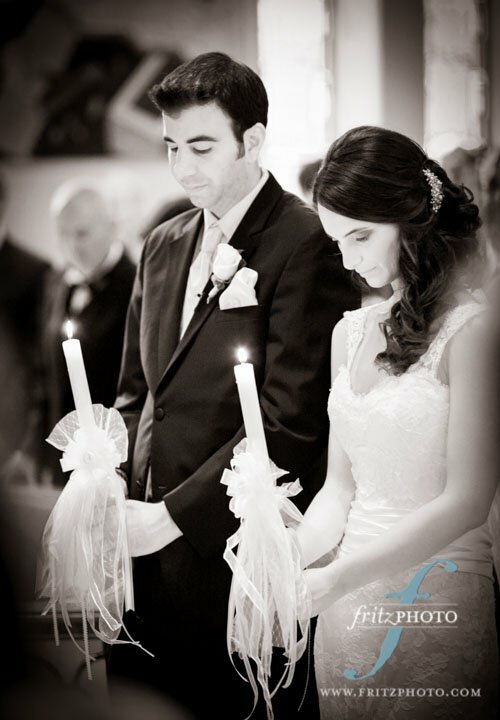 The wedding ceremony was held at Holy Trinity Greek Orthodox Cathedral in Portland. A traditional Greek Orthodox wedding ceremony, we found it unusually beautiful that almost the entire ceremony was sung or chanted. Hardly a word in the wedding ceremony was spoken. It was also set in a beautiful space, full of warm light (from the stained glass) and surrounded by paintings and icons. And then there’s Nick and Elena. She’s tall, dark, and lovely, a doctor of psychology. Nick is also tall, laughs easily, and partners with his father in commercial real estate. In fact, Nick has been traveling to California regularly to finish his MBA–and also to court Elena, who worked down there over the past decade. But the coolest part of the story is this: they met when they were 15, both of them counselors at Camp Angelos. Many years (and many trips to California) later, Nick proposed to Elena, also at Camp Angelos, down on the rocky beach of the Sandy River. And one year later, that is where they held their wedding reception. So it was especially meaningful for us to photograph Nick and Elena in the woods and down on the rocks of the river, where they first met, became engaged, and were now celebrating their wedding. We enjoyed photographing so many details of this wedding…we ended up grinning from ear to ear during the entire reception. Nick’s classic car was used as their ‘getaway car’ after the ceremony. The rest of the bridal party rode on the Party Bus, which managed to break down on the highway halfway to the reception at Camp Angelos. When the bride and groom walked in to the wedding reception, a confetti cannon hailed their arrival. The flower girls and ringbearers in the family were a delight to photograph. And as the light faded over the Douglas Firs, the dancing was just getting started, and lasted long into the evening. It was a romantic, hilarious, and delightful celebration of such a wonderful couple, who’ve known each other since they were teenagers. Pure art. Such an incredible experience watching this excelent job. The simplicity and elegance in this wedding is splendid! What a day! Such a beautiful bride…and bubbling with personality! The closeup of the little boy made me LOL! 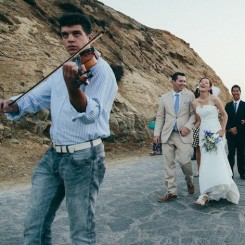 A SPECTACULAR job capturing the essence of what had to be a perfect day/night! Thanks for sharing! Such gorgeous photography. Love the shallow depth of field in those shots. They couple also look pretty fun. Their personalities really show. Keep up the good work! Nick and Elena, thank you for being such a delight to work with! And for having such a fun family! Your wedding was one of the most surprising and delightful weddings that we photographed this year. Many blessings.